The KRAMER by ZWILLING EUROLINE Carbon Collection is the first line created with Master Bladesmith Bob Kramer. With over 18 years of forging experience, Bob has partnered with ZWILLING J.A. Henckels to craft a knife that is an exact replica of the straight carbon steel knives made in his Olympia, Washington workshop.Bob's design has an extremely wide blade to maximize knuckle clearance for larger hands and for cutting through large produce and piles of food. Chopped food can easily be transported with this impressive, broad blade.A material nearly lost to the home kitchen, straight carbon steel requires knowledge and care to maintain. In return, owners will be rewarded with a sharpness and keenness of edge that only straight carbon can deliver. Hand-finished with a 3-step process by the most skilled Japanese artisans, the outstanding blade is paired with a stunning handshaped Grenadille wood handle with brass rivets and a Bob Kramer mosaic pin. 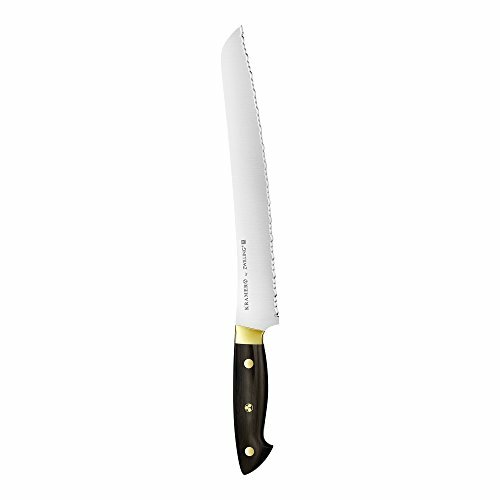 Wusthof Epicure Slate Double-Serrated Bread Knife 3352-7/23 , 9"
Wusthof Classic Ikon Bread Knife 4166/23 , 9"